Title: Female students with A’s have similar physics self-efficacy as male students with C’s in introductory courses: A cause for alarm? Despite efforts to increase the representation of women in physics, the percentage of physics degrees awarded to women has remained approximately constant at 20% over the last decade. Of course, increasing the number of physics degrees being awarded to women requires increasing the number of women choosing to major in physics. Many factors go into choosing a STEM field and physics in particular such as students’ prior preparation, the quality and the type of teaching, sociocultural factors, and motivational factors. The authors of today’s paper chose to focus on one aspect of motivation: self-efficacy. Self-efficacy is simply the belief in one’s capacity to be successful in a particular task, course, or subject area. Higher self-efficacy has been found to be predictive of enrolling in STEM courses and of persisting toward long term career goals. Those with high self-efficacy are also more likely to enroll in difficult courses than those with low self-efficacy because those with low self-efficacy are likely to see the difficulty as a threat rather than a challenge. As students with higher self-efficacy are more likely to exhibit effective learning strategies(and hence do better), a feedback loop is created: students with higher initial self-efficacy have higher performance, leading to increased self-efficacy while the opposite happens for low initial self-efficacy. 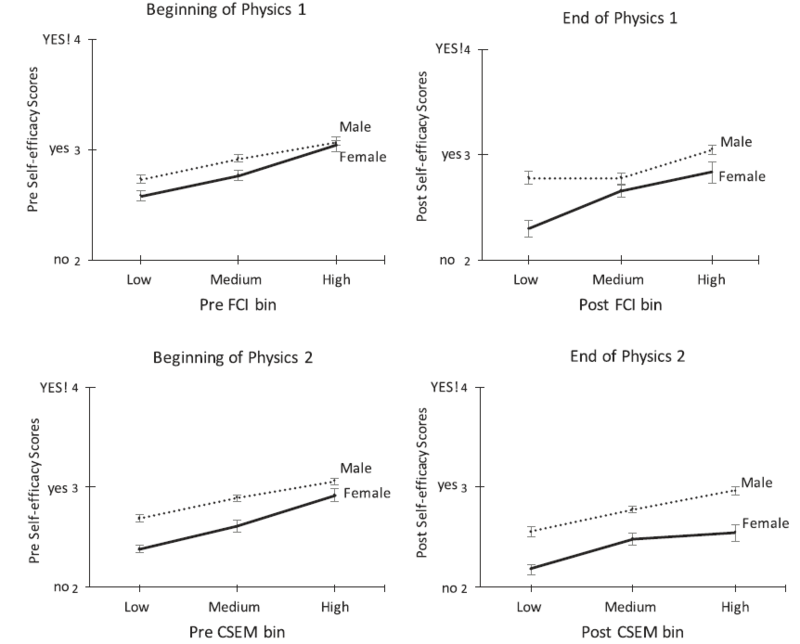 In physics, women consistently report lower self-efficacy than males, regardless of the type of instruction (traditional vs interactive engagement) or whether they have taken a previous physics course. Coupled with the finding that men tend to assess their mathematics ability as higher than that of women of similar ability, the low representation of women in physics may be partially explained by differences in self-efficacy. 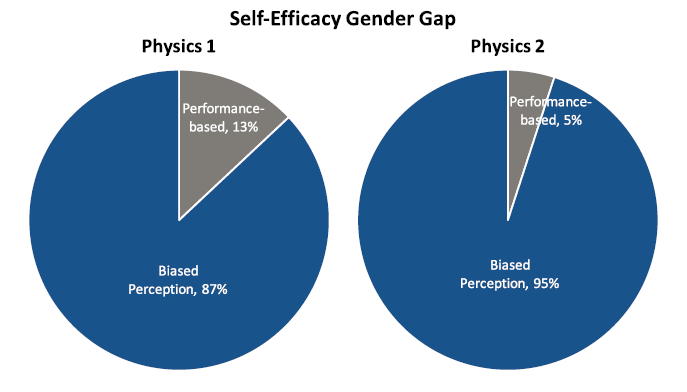 The goal of this paper to investigate how self-efficacy of men and women differs when taking into account performance and how their physics course is taught. To conduct this study, the authors administered a motivation survey and research-based conceptual assessments 3 times to 20 sections of a two-semester calculus-based introductory physics course at a large research institution. The course consisted of four hours of lecture a week and 1 hour of recitation, during which a low-stakes quiz was given. Around half of sections were offered as “flipped classrooms,” in which students watched the lectures at home before coming to class and then used class time to work on collaborative groups problems and clicker questions. The conceptual assessments were then given during the first and last recitation periods of each semester. The motivation survey was included for the first recitation period of the first semester course and the first and last recitation period of the second semester course. So what did they find? First, to analyze their results, the researchers grouped the students into three approximately equal bins according to their conceptual assessment scores (low, medium, high score) and bins according to their grade: C (C and C+), B (B-, B, B+), and A (A-, A). A C- and below was excluded because these grades do not allow the students to continue onto the next course in the sequence. 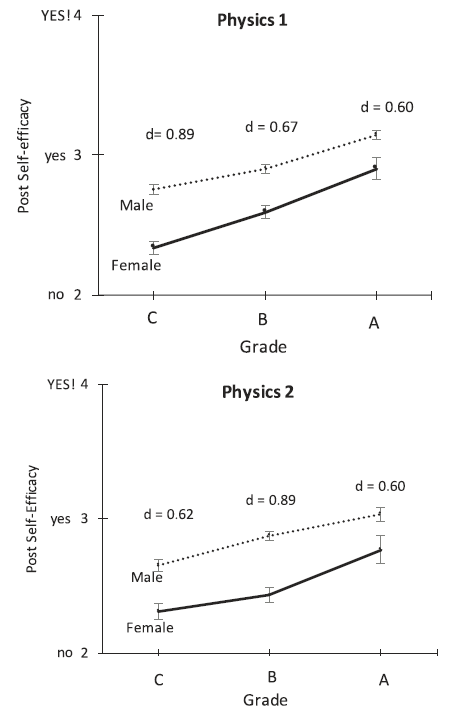 As shown in figure 1, at the start of the semester, both gender and score on the conceptual assessment had a significant effect on reported self-efficacy; however there was no interaction between gender and score. In contrast, on the post-test, there was a significant interaction between gender and assessment score for physics 1. This interaction was not observed at the end of the second semester course however. Interestingly, at the end of both the first and second semester physics courses, the self-efficacy of women who had scored highest on the conceptual assessment was not statistically different from the self-efficacy of men who had done the worst on the conceptual assessment. Figure 1: Comparison of scores on conceptual assessments (FCI for first semester and CSEM for second semester) and reported self-efficacy. In all cases, women have lower self-efficacy scores than men with similar conceptual scores do. (Fig 1 in paper). Next, the researchers used the final grade in each course instead of score on the conceptual assessment to see if the same patterns held. Sure enough, women had lower self-efficacy than men who had earned the same grade did. Additionally, women who had earned “A”s in the course had a self-efficacy score similar to that of men who had earned “C”s in the course (figure 2). After finding that women had lower self-efficacy than men who performed similarly in the class and that self-efficacy increased with better performance in the class for both genders, the researchers wanted to determine whether gender or performance had a larger impact on self-efficacy. Using an ANCOVA with grades and gender as the independent variables and self-efficacy as the dependent variable, the researchers found that grade only had a small influence on self-efficacy and that most of the self-efficacy gap (over 85% in both the first and second semester courses) could be explained by gender, meaning biased perceptions about men and women’s abilities in physics can account for most of the self-efficacy gap (figure 3). Figure 3: Relative contribution of performance (grades) and biased perception (gender) to the observed gender gap. (Fig 3 in paper). Finally, the researchers wanted to see if the way the course was taught affected the gap. To do so, the researchers ran linear regression models with gender and assessment pre-test scores as independent variables for each of the sections. If the coefficient of gender in the model was the same for the traditional courses as it was for the “flipped” classrooms, then the type of instruction had no effect on the gap. Indeed, on average, the coefficient of gender was approximately the same for traditional and “flipped” classrooms, meaning that how the class was taught does not affect the self-efficacy gap. 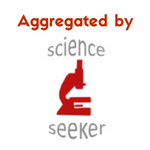 Having observed this self-efficacy gap, the researchers tried to explain why this may be the case. Perhaps it is due to the culture of physics, which overemphasizes contributions of “brilliant” men, causing women to feel they need to make extra efforts to be as successful as their male counterparts. Alternatively, it may be how men and women frame their successes and failures. For example, when studying gender differences in math, Tobias (Banishing Math Anxiety) found that girls who do well in math attribute it to luck while boys attribute their success to inner ability and girls who do poorly attribute it to a lack of ability while boys attribute it to a lack of effort. So what can we take away from this paper? First, women have lower self-efficacy than men do at every measured point during the study and this self-efficacy gap persists even among men and women who earn similar grades in the course or scores on a conceptual assessment, suggesting the gap is due to gender perceptions rather than ability. Second, this gap occurs in both traditional and “flipped” classrooms and increases during the course of the semester. As the gap grows during the course of the semester, any intervention to curve the gap likely needs to focus on how the instruction occurs. But as this paper shows, simply changing to some type of active learning is not enough. Figures used under Creative Commons Attribution 4.0 License. Header images from Flickr (here and here) and used under CC BY 2.0.